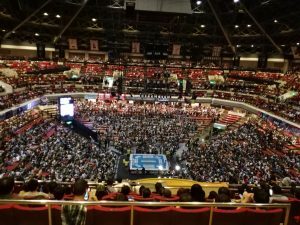 WH Park looks at the ten best venues to watch professional wrestling in Japan with his firsthand accounts of buildings ranging from Budokan Hall to Hakata Star Lanes, and more. In my time as a wrestling fan I have been to a lot of live events ranging from venues in the Great White North such as the fabled Maple Leaf Gardens, The Air Canada Center, Copps Coliseum, Ted Reeve Arena, St. John’s Hall and some random “barn” out in Bolton, Ontario to south of the border (I’m Canadian, eh?) shows in upstate New York for some ROH shows (John Pollock would know at least the name of one of them). However, nothing in Canada or the U.S. matches watching professional wrestling live in Japan. My first Japanese wrestling shows were during the time I lived in Osaka. Between 2000 and 2001, I got to see some Osaka Pro shows as well as a big NOAH show during that company’s infancy. It wasn’t until 2006 that I finally watched my first wrestling show in the greatest pro wrestling city in the world – Tokyo. There are so many things I love about going to live shows in Japan. From the decorum and energy of the fans to the quality of the wrestling and the venues. I have had the fortune to have gone to so many different buildings in different cities that are famous for hosting puroresu. From Tokyo to Saitama to Kyoto to Fukuoka each place has its share of cool arenas, theaters and halls to enjoy the wonder of Japanese wrestling. 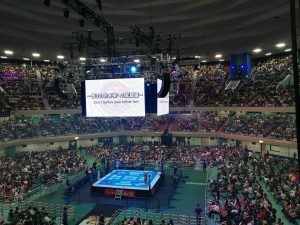 Here are 10 of my favorite places to watch wrestling in Japan. It is also the home of New Japan’s annual January 4 super event, Wrestle Kingdom. Other promotions have also run legendary shows there, from All Japan to NOAH to the Joshi supershow, Big Egg Wrestling Universe. Many historical matches have taken place there and it hosts the biggest event on the wrestling calendar for traveling fans outside of WrestleMania. But to be honest there is a reason it sits at number 10 on this list. Having been to 6 of the last 8 Wrestle Kingdoms since 2011, I have to say that the shine of going there has really worn off for me. The Dome’s greatest feature, its size, is its biggest negative for me. Holding a capacity of about 40,000 (yes, you should doubt any reported attendance figures north of 40k) it is the largest building I have been to for wrestling anywhere. It has an impersonal atmosphere, bad acoustics and there are no great seats in the entire building in comparison to other places I’ve been to. The reasons it’s here are because of how many great matches have happened there and its fame. *If you want to find out more about the history of wrestling in the Tokyo Dome check out Chris Charlton’s excellent book, Eggshells and the companion podcast of the same name found here on POST Wrestling. One must travel a little out of the city center of Tokyo to the Ōta ward to find this place. The Ota Gym is primarily used for basketball games by the Earth Friends Tokyo Z (no seriously, that’s the name of the team). It’s a modern building compared to some of the others that I’ll be talking about on this list. It holds just under 4000 fans, but it retains a nice intimacy like a building half the size. I would say there are very few bad sight lines anywhere in the arena and the acoustics are great. As a bonus, it has a good air conditioning system which keeps the arena fairly comfortable. Seating consists of chairs on the floor and bleacher seats. It is the bleacher system which drops it down to number 9 for me. I have to say that after about an hour of sitting with no back support I was not enjoying being there. I had to get up between every match just to stretch my legs and my back. And while I enjoyed the show overall the inconvenience and discomfort of sitting inside there keeps it low on the list. The furthest venue from Tokyo on this list (roughly 1,100 km) in the Hakata ward of Fukuoka City in Fukuoka Prefecture. It takes roughly 4 hours to travel there on the Bullet Train from Tokyo Station. 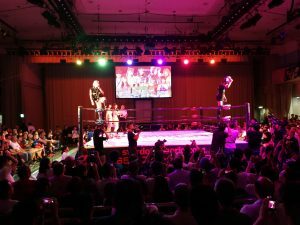 It is probably the most well-known venue in the southwestern part of Japan because nearly every major promotion runs shows there with the notable exception of New Japan Pro Wrestling, which usually goes to the Fukuoka Convention Center for big shows. Pro Wrestling NOAH, Big Japan, Dragon Gate, Stardom and All Japan Pro Wrestling all run events at Hakata Star Lanes. This is probably due to the relatively low cost of renting it and its convenient location. It opened in 1974 primarily as a multipurpose entertainment facility with a focus on bowling (hence the giant bowling pins on the front and top of the building). It’s also a place where residents can go do karaoke, have dinner and of course watch wrestling. I’m guessing it can hold up to 600-700 fans depending on the demand for tickets. I was able to see one of the Champion Carnival shows there last year and in retrospect, I’m so glad I had that opportunity because it will be closing permanently in March of this year. The main reason cited is that the building is so old that it wouldn’t be cost effective to renovate it in order to meet modern requirements to withstand major earthquakes in Japan. Having been there I can say that it’s not surprising as I thought the building was kind of a dump. I loved being in this oddly-named building to watch wrestling. In that respect, it’s quite a fun place to watch a show. Easy to get to from major train stations and located in an area with lots of convenience stores and restaurants. To get to the arena section you just go up one flight of stairs and there you are. A predominantly flat floor space there is an elevated section for going to the backstage area. One feature I really liked was that the flat floor sections have raised seats in the back-seating area so you’re not always trying to look over or around the heads of the people in front of you. Spacious area for merchandise tables inside where you can easily navigate getting shirts, towels, and whatnot from your favorite wrestlers (who are usually selling their wares themselves). If you are able to come to Japan before March and can head out to Hakata for a wrestling show I would recommend going to Star Lanes for one final time before it permanently closes. Heading back to Tokyo and to the Shin-Kiba area is 1st Ring. Looking at its outer facade one would be forgiven for walking past it and thinking it was just another warehouse like the other buildings in the surrounding industrial park area that it’s located in. It holds about 290 people according to Wikipedia and I can believe that. I like the design with a stage and ramp set-up where the wrestlers enter from backstage. The most intimate location I’ve been to watch wrestling, there is not a single bad seat in there unless you consider having wrestlers crashing into you during dives and brawls on the outside bad seats. 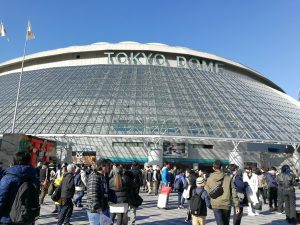 During Wrestle Kingdom weekend I was able to watch Stardom and Big Japan shows there. All the merchandise and same day ticket sales are done outside the building (except for All Japan as I’ve seen shows on TV where they somehow set up merch tables inside). Big Japan is also well-known for having a table dedicated to selling alcoholic drinks served by the talents which on this day was Jaki Numazawa. Easy to get there from Shin-Kiba Station though I do recommend loading up on snacks at stores near the station as there is literally nothing else but warehouses in the immediate vicinity. I highly recommend going to see a show there as it has a really unique vibe to it. As far as I can tell this building is exclusively used for the finals of New Japan’s Best of the Super Junior tournament. Easily accessible by train, you can go to either Harajuku or Yoyogi Stations to get there. Close to Yoyogi Park which is a destination I recommend you visit, possibly before a show there. One of my favorite aspects of this building is the interior design. Each “row of seats” forms like a circle to have more of an amphitheater feel. Also, fairly spacious in comparison to other places so it’s one of the more comfortable experiences I’ve ever had watching wrestling in Japan. Excellent sight lines pretty much anywhere in the building so there’s not a bad seat in the house. Really my only criticism of Yoyogi Gym #2 is that there aren’t more shows run there. Early on in my puroresu fandom days, I would get tapes of All Japan shows during the peak period of the 90s featuring legendary matches between Mitsuharu Misawa, Toshiaki Kawada, Kenta Kobashi, Akira Taue, Stan Hansen, Steve Williams, and countless others. Most of these matches would take place at the arena most synonymous with the promotion, Nippon Budokan. Originally built to hold the judo competitions for the 1964 Summer Olympics it has since been the site of a variety of other events including music concerts by big name artists from the Beatles to Led Zeppelin to AKB48. It is located inside Kitanomaru Park, which is designed like the grounds of a traditional castle. There is a surrounding moat and a multitude of trees on the grounds so you would not expect to be going to watch pro wrestling as you pass through its gates. It’s relatively easy to get to as it’s located near Kudanshita Subway Station and if you are coming from the Tokyo Dome/Korakuen Hall area you can walk there within 20-30 minutes. Originally well-known to be the home of big All Japan main events, it later became famous for being the main event venue for Pro Wrestling NOAH following the split of Mitsuharu Misawa and company after the death of Giant Baba. By the time I was in Japan wrestling in Budokan had pretty much disappeared and I gave up hope of ever seeing professional wrestling there. Thankfully in 2018 New Japan announced that they would be holding the last 3 nights of their incredibly popular G1 Climax tournament in the building. One of the reasons for moving these shows from the G1’s usual location of Sumo Hall was that it was undergoing some renovations at the time. However, I also feel that the popularity of the tournament has outgrown Sumo Hall, which would often sell-out very quickly when tickets went on sale. Thankfully I was able to get tickets to all 3 nights of this historic occasion. I also lucked out in that the seats I had were located right near the edge of the balcony section, so I had an excellent view every show I went to. As a bonus, despite the sweltering heat outside that is typical of August in Tokyo, I was perfectly comfortable thanks to the AC here which completely outclasses Sumo Hall. 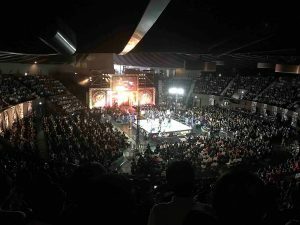 For those who missed out on the pleasure of watching wrestling at Budokan Hall in the past, you’ll have a chance this year as NJPW announced that they would be returning there for the last 3 nights of the 2019 G1. I highly recommend making it a destination trip for those who live outside of Tokyo. Sumo Hall opened in 1985 to primarily host the traditional Japanese martial art of Sumo wrestling and of course, it is also used for pro wrestling. You can find Kokugikan in the Ryōgoku area of Tokyo right next to the train station of the same name. Besides the arena, there is also the Edo-Tokyo museum and a multitude of stores, hotels, and restaurants including ones dedicated to serving chankonabe. Chankonabe is the traditional food for wrestlers, both sumo and professional, to help them gain weight and mass. While primarily the home of some of New Japan’s biggest shows like King of Pro Wrestling, Sakura Genesis and until recently, the G1 Climax Finals, various other promotions do run big shows there as well. These include DDT, Big Japan, All Japan, NOAH and even the WWE. The most recent show I attended was the Naomichi Marufuji 20th Anniversary show. The inside is well designed with most of the seats, including those up in the rafters having pretty good sight lines. There are 3 main seating sections for both Sumo and puroresu. First are the floor seats which are the most expensive. Next are the “box” seats which is basically a square space where you sit on cushions on the ground as opposed to seats. The maximum number of people that can sit in these spaces is 4 but I can tell you from experience that this number is stretching the limits of human comfort for your average sized person. Then we have the elevated or balcony levels which stretch all the way to the top of the arena. This is where I usually like to sit as it affords the most comfort for the best price. Having sat everywhere from the box seats to the upper tiers (I hate floor seats so I never bothered with getting tickets there) I will say that the higher you go the more discomfort you’re likely to feel from the temperature inside. This is especially true during the summer months. Of course your mileage might vary as I’ve been told from friends that I’m exaggerating or overreacting to how hot it gets in there but all I’ll say in my defense is that it’s the only building I’ve ever been in where I’ve contemplated screaming to the outside after being inside for only an hour. If you are there for a show in the summer, I would recommend staying hydrated as much as possible and bringing in wet napkins to keep yourself clean. Still it is a great place to watch wrestling because of its rich history in regard to pro wrestling. Just go in the fall, winter or spring. Probably the most beautiful venue I’ve ever seen professional wrestling at thanks to KBS Hall’s unique interior design. 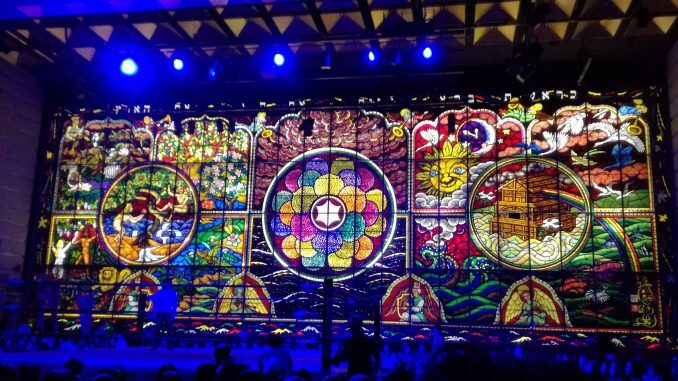 Featuring a backdrop designed like a stained-glass window depicting the creation story found in Genesis, you immediately know when you are watching an event from KBS Hall. One must travel to the city of Kyoto to reach this arena. Kyoto is one of the main cities’ tourists go to experience traditional Japanese culture due to the number of famous shrines and temples located there. One can have a wide variety of experiences in Kyoto aside from just watching wrestling. Not the biggest or smallest venue on this list, Wikipedia and other sites say the capacity is 1000 people but I’m probably going to say it’s a little less than that for wrestling. KBS Hall is also used for cultural events and concerts. The exterior belies what awaits you on the inside. It’s located on the first floor of a two-story building that looks like the headquarters of a small business. The lobby is also innocuous but once I stepped into the arena area my breath was taken away. Before the opening bell, the backdrop is unlit but you can still appreciate the beauty of the art. 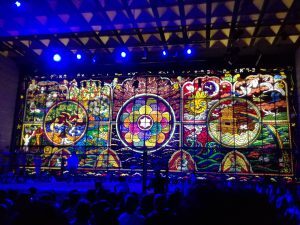 When the show starts and the wall was lit up, I marveled at the majesty of the wall (which is not actually made of stained glass) and the effect it had on the space itself. Seating inside is pedestrian with good views of the ring to be had pretty much everywhere. No elevated sections of significance but it’s not completely a flat floor design. Has a very intimate atmosphere as you feel very close to the ring no matter where you sit. This contrasts very nicely with the epic feel of the “stained glass” backdrop. Promotions of note that run there include All Japan, Stardom, NOAH and Dragon Gate, the promotion I most associate the building with. Be aware that most of the shows that run there tend to be “house shows” with fairly few matches being of major significance in terms of storylines or angles. The main attraction is that wall. Located directly across from Kyōto-gyoen, a famous landmark that hosts the Kyoto Imperial Palace among other things, it is a easy place to find and get to. Not much in the way of eateries or stores so I recommend stocking up on drinks and snacks beforehand. While Tokyo is well-known for being the mecca of professional wrestling in Japan and having some of the most dedicated and passionate fans for all wrestling promotions, it is the city of Osaka which I feel has the most die-hard fans of one promotion, New Japan Pro Wrestling. My first time experiencing the passion the Osaka fans for NJPW was on April 27, 2008, at the Osaka Prefectural Gymnasium which is now known as Edion Arena. I attended a show headlined by then IWGP Champion, Shinsuke Nakamura defending his title against former New Japan legend, Keiji Muto, who at this point had become All Japan’s biggest star. Even though Muto was an “outsider” to New Japan he was still seen as a New Japan guy by these fans who gave one of the loudest reactions I ever experienced when he beat Nakamura. Originally built in 1952, it was later rebuilt in 1987. Like Kokugikan this building is home to both Sumo and pro wrestling. It holds about 5,500 for wrestling. The biggest event it usually holds on the New Japan calendar is a single date for the G1 Climax tournament though in 2018 that number was doubled. A well-designed interior with excellent seats throughout, it also boasts probably the best AC I’ve ever had the pleasure to experience. And yes, I know I go on about air conditioning a lot but if you have ever been to Osaka between the months of June to September you would understand how important this is. 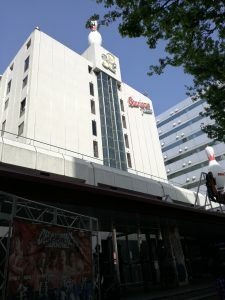 Edion Arena is deep in the heart of downtown Osaka in the Namba region. Pretty much anything you want to do from shopping, eating, playing video games to drinking can be found in this area. I have an immense fondness for Osaka not only because I used to live there but it’s also one of my favorite cities to watch wrestling in. Finally, we have reached the end of our journey and reached the TRUE and UNDENIABLE center of puroresu. When you read the title of this piece and clicked on that link was there any doubt that it would be the legendary Korakuen Hall? This is without a doubt the best venue to watch professional wrestling anywhere in the world and I would bet dollars to donuts that anyone who has ever stepped in here would agree with me. Easily found inside the area of Tokyo Dome City, you can get there easily via Suidobashi and Korakuen Stations which are home to several train lines. It opened in 1962 and is the premier home of not only wrestling but boxing, MMA and a host of other martial art events. About a 5-minute walk from the Tokyo Dome and right next to a TGIF. Once inside you go up to the fifth floor of the Korakuen building by either elevator or stairs. There are four types of seating here. Floor seats using folding chairs, the bleachers, the orange seats on the hard cam side or the standing room only balcony. Any of these locations afford an excellent view of the ring. You’re taking your chances sitting on the floors as almost all promotions will feature at least one match with brawling into the seat areas. Of course, brawling is known to take place in the bleachers and orange sections as well. If you are a bigger person with long legs, I would recommend any seat EXCEPT the orange section. It’s tight for even for me and I’m about 5’6”. Still, those are my favorite seats in the hall and I always try to get tickets there. 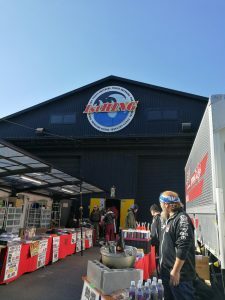 Once you pass through the front lobby you are usually led past the merch tables and depending on the promotion you are likely to be able to buy directly from the wrestlers themselves. After that, you are in the main lobby with the concession stands, washrooms and smoking room. From there you go inside and there you are in puroresu paradise. It still hits me how much history has happened within the walls of Korakuen every time I go in there. My first ever Korakuen show was on December 22, 2006, for the King of Gate finals between Masaaki Mochizuki vs. Ryo Saito. Since then I’ve attended shows from NOAH, All Japan, Big Japan, Stardom and of course a host of New Japan shows. 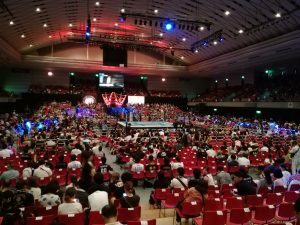 Because of its popularity, location and most importantly, relative low rental cost, nearly all promotions of any note run shows at Korakuen. Some days there are multiple shows by multiple promotions especially during the weeks before, during and immediately after Wrestle Kingdom, Golden Week and G1 Finals week. If you love puroresu then a trip to Korakuen Hall to take in live wrestling has to be your number one priority. It doesn’t matter which promotion you are the most passionate about since they are likely to run there at some point in the calendar year. I hope this list was helpful and that it sparked an interest in checking out wrestling at any one of these venues. I’m sure whichever one you go to will provide an unforgettable experience and lasting memories. Special thanks to Matt McEwen for proofreading and editing this piece.